The 15 year old Norwegian, Martin Odegaard, entered the match vs. Bulgaria in the 63rd minute on Monday evening, becoming the youngest player ever to play in the Euro Cup Qualifiers. The young attacking midfielder, born on December 17th, 1998, was 15 years and 300 days old when he entered the game, breaking the record previously held by Sigurdur Jonsson of Iceland, who played his first match when he was 16 years and 251 days old. Martin Odegaard plays his football at Stromsgodset in Norway's top division. The young player has already trained with Manchester United, Bayern Munich, Borussia Dortmund and Stuttgart, while every one of his performances is being carefully watched by the scouts from European powerhouse teams such as Real Madrid, Arsenal and Liverpool. 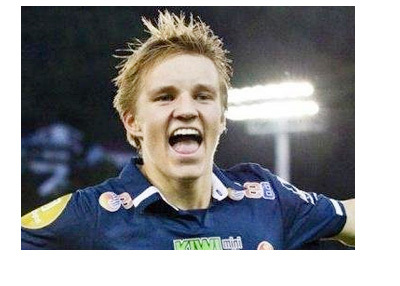 Martin Odegaard, son of a former Norwegian football player, is already being compared to Lionel Messi. Let's see how the career of young Odegaard develops from here.